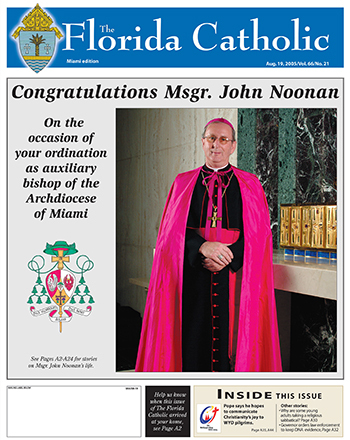 MIAMI | Editor’s note: The following is a new feature highlighting a month in archdiocesan history, as the Miami archdiocese continues its 60th anniversary celebration. A “White Gala to Honor the White Collar” will take place Oct. 20, 2018, with proceeds benefiting the two local seminaries. Here are some of the historical highlights for August. 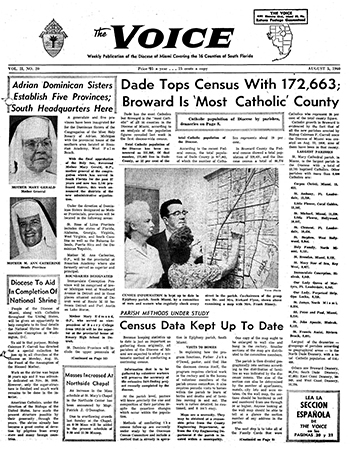 Aug. 13: Pope Pius XII announces the creation of the Diocese of Miami, embracing 16 counties in South Florida with Bishop Coleman Carroll as founding bishop. The names of four new high schools under construction in the diocese are announced: Msgr. 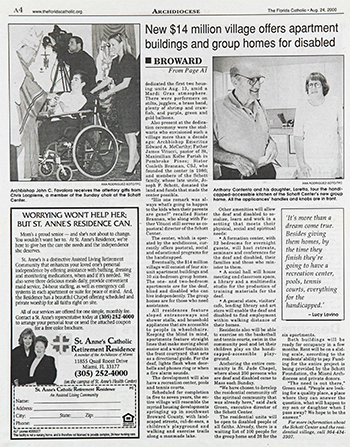 Edward Pace in Miami, to be staffed by Marist Brothers; Cardinal Newman in West Palm Beach, to be staffed by Adrian Dominican Sisters; Cardinal Gibbons in Fort Lauderdale, to be staffed by Piarist Fathers and Sisters of St. Francis of Mary Immaculate; La Salle in Miami, to be staffed by Brothers of the Christian Schools. 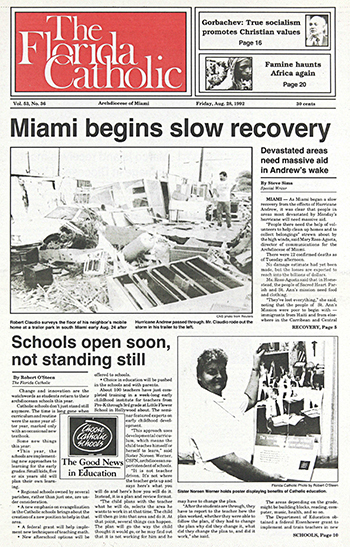 Havana’s famed Colegio de Belen announces its relocation to Miami after being seized by Cuba’s communist government. Classes for the Jesuit-run Belen High will begin in September on the fifth floor of Gesu School in downtown Miami, for boys in grades seven through 12. 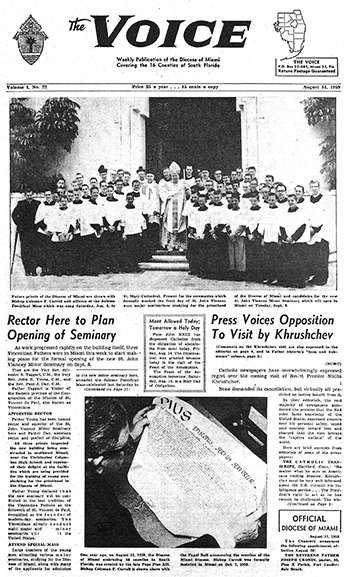 Plans get underway for “the first Catholic college for men to be established in the Diocese of Miami,” operated by the Augustinian Fathers. 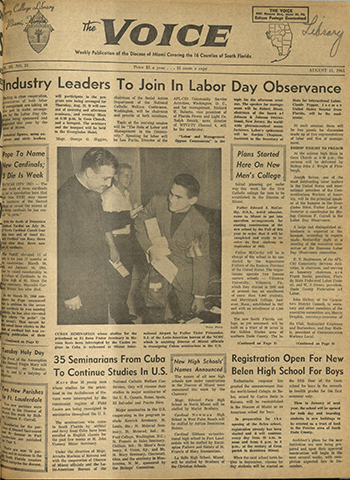 The yet-to-be-named school (now St. Thomas University) will be ready to receive its first students in September 1962. 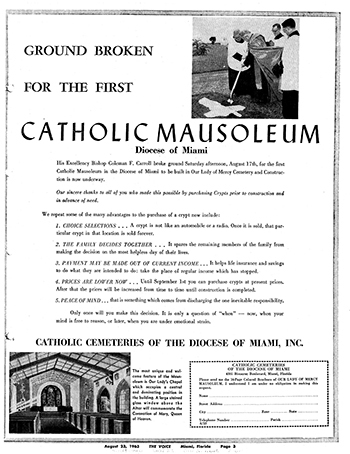 Bishop Carroll breaks ground for Our Lady of Mercy Mausoleum in Miami, the first Catholic mausoleum in the state, to be constructed on a site four and one-half miles west of Miami International Airport, at 11411 N.W. 25 Street. Archbishop Edward McCarthy designates August 6 as a day of prayer and fasting for all refugees and displaced persons. Corpus Christi Parish opens four missions within its boundaries to reach out more effectively to the parish community. “There are 17 Protestant churches within the parish boundaries. Why can't we have 17 Catholic missions?” says the church’s pastor, Father Jose Luis Menendez. Each mission is named after a patron saint of the different cultural groups in the largely Hispanic Wynwood area: San Juan Bautista, La Milagrosa, San Francisco and Santa Clara, and Nuestra Señora de Altagracia. Mass will be celebrated on Sundays at the missions, which will also host weekday meetings. About 150 Chinese Catholics attend the first Chinese-language Mass celebrated in the archdiocese, at St. Thomas the Apostle Church in Miami. The presider is Father Joseph Chiang, director of the U.S. Chinese Catholic Apostolate. About 15,000 Chinese Catholics are estimated to live in South Florida. 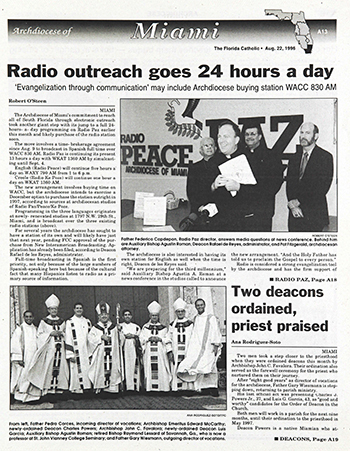 Radio Paz expands its broadcast from 13 hours to 24 hours a day by moving to WACC-830 AM, a station which the archdiocese will purchase. English-language programming remains on WAXY-790 AM for five hours a day. 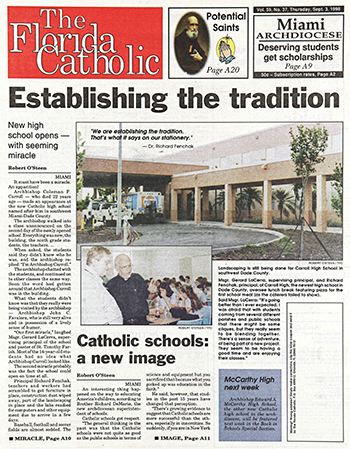 Classes begin at Archbishop Edward McCarthy Highin Broward and Archbishop Coleman Carroll High in southwest Miami-Dade, the first Catholic high schools built in the archdiocese in more than 25 years. A new archdiocesan village for the disabled, the only one of its kind in the nation, is dedicated Aug. 4 in Cooper City. 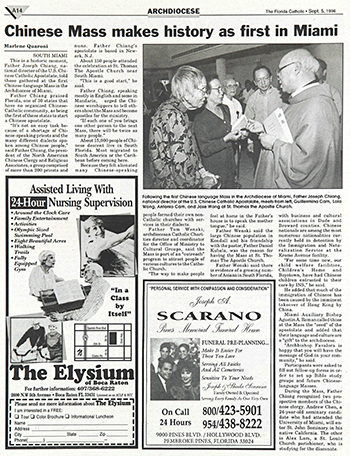 The Schott Center (now Schott Communities) includes apartments and group homes for the deaf and disabled as well as pastoral, social and educational programs. As a new school year begins, iPads become a prevalent presence in most archdiocesan schools, in some instances completely replacing textbooks.